This week's Game of Thrones episode was a tad bit on the slow side with tons of talking, but that doesn't mean it was a bad episode (which I've seen tons of people say). 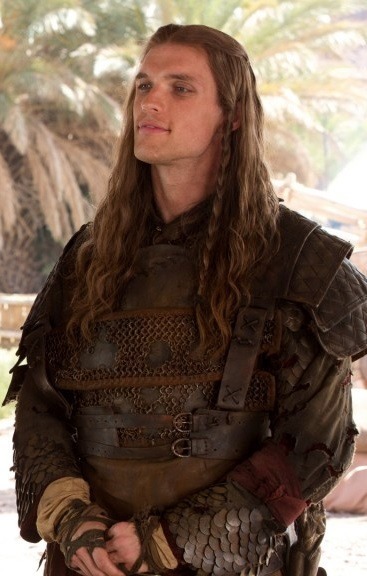 Second Sons introduced Daario, had a wedding, and some crazy action at the end. I've rounded up from favorite quotes from the episode below! - Who else was yelling at Samwell to go back and pick up the dragonglass? (The crows scared me just as much as the White Walker). - Joffrey needs all the punching. - I liked that Cersei explained the significance of the song the Rains of Castamere to Margaery. - No Theon! Thank the gods. - Drunk Tyrion is the most entertaining. - I get tired of the naked bits quota. I think they should turn the tables around and only have completely covered characters in just one episode. - Davos reading to himself in his cell was endearing and a nice little character moment. Two weeks until episode 9! When The Clone Wars was cancelled, we were promised a new animated series was in the pipelines. 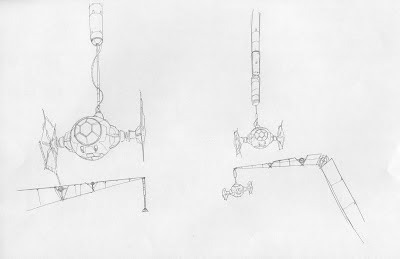 Since then we've heard Dave Filoni is working on that series and he's posted a tease of a TIE Fighter he's drawn (above). And as of this morning, the cat is officially out of the bag: Star Wars Rebels will premiere in fall 2014. Gary Marsh, president and chief creative officer, Disney Channels Worldwide, said, "The entire team at Lucasfilm has provided extraordinary creativity and innovation for over three decades, and we're thrilled to be bringing the expansive and imaginative world of Star Wars to Disney XD's viewers." "I couldn't be more excited to explore new corners of the Star Wars universe,” said Kathleen Kennedy, president, Lucasfilm. 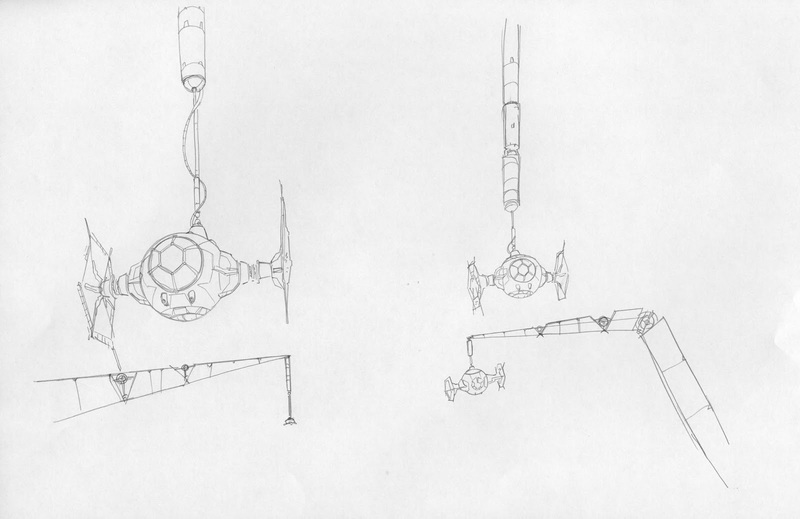 “I think Star Wars Rebels will capture the look, feel and fun that both kids and their parents love about Star Wars." Star Wars Rebels will be produced by Lucasfilm Animation, featuring many of the key talents that made Star Wars: The Clone Wars. Fans attending Star Wars Celebration Europe will be the first to get an exclusive look at the new series. Casting will be announced at a later date. While I still don't fully understand why The Clone Wars had to go and I'm still bummed about it (and would love some news on the bonus content), I can't deny I'm crazy excited about Star Wars Rebels. Finally - a series that explores a new timeline and the aftershocks of Order 66! And it's in the hands of wonderful and talented people who care about Star Wars and the fans. All the exclamation points!! Keep an eye on the official Facebook page for the series for further announcements. 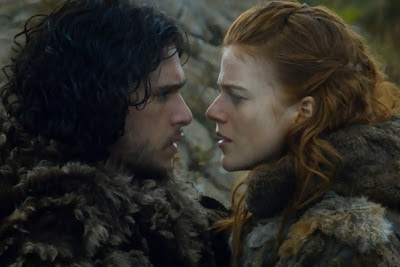 Game of Thrones annoyed me a little with "The Climb" (you'll notice I didn't round up quotes for it last week), but the series was back in fighting form with "The Bear and The Maiden Fair." The George R. R. Martin penned episode was intriguing and action packed, though it did have what seemed like more sexual overtones than normal. Check out my favorite quotes from the episode after the image (and beware spoilers). - ENOUGH with Theon for the love of all the gods in Westeros. Please stop wasting time on him. - Along that line, Osha doesn't like the Reeds. We get it. - Tywin should council Joffrey all day, every day. I liked seeing Joffrey literally shrink away from his grandfather. 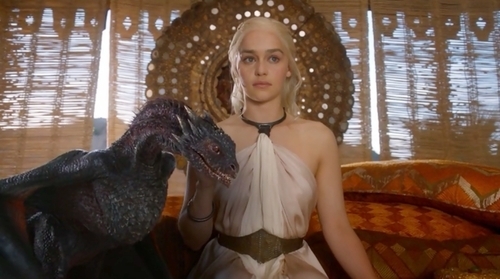 - Daenerys sure has a lot of titles. Seriously though,watching her take the Yunkai lord down a peg was satisfying. 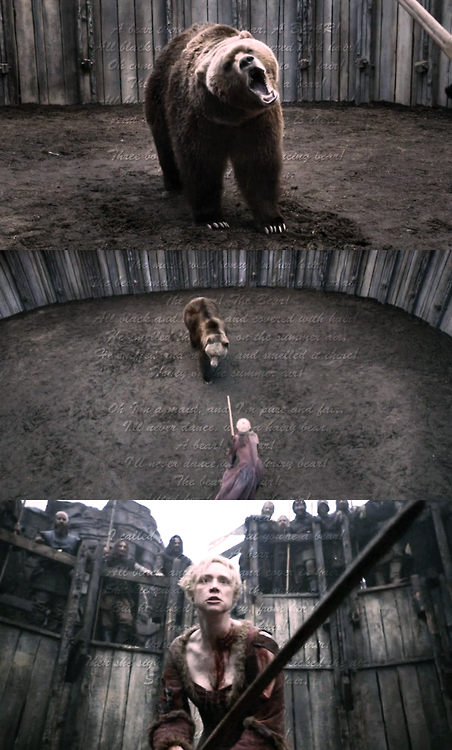 - Jaime Lannister and Brienne of Tarth win again. They've become my favorite pair to watch this season. - Jaime lived a heroic ballad. Watching Nikolaj Coster-Waldau take the character on this journey is impressive. Give that man an Emmy. - Sansa is so naive it hurts. I think part of Margaery truly pities the little dove. - Speaking of Starks, why don't they ever listen? Arya should have stayed with the Brotherhood without Banners. - Interesting that they played the Rains of Castamere in the last scene. - And let's not forget: BEAR! Who's watching Arrow? Considering the show's popularity and ratings, I bet several of you are. I caught up on the series when it was just a little over halfway through the first season, and I mainlined it from my Tivo. I couldn't help it. Once I was in, I was hooked. Intriguing story, fun characters, action, archery - what's not to like? A strip this week at the The Gutters reminded me of an experience I recently had in which a guy made an assumption about why women watch Arrow. I covered the Arrow press room at a convention not too long ago. I sat down at a table of mostly ladies and a few guys (five ladies, three guys - I counted). I'm shy so I tend to keep to myself unless someone initiates conversation, and in this case, I jumped into some conversations about comics. Daredevil came up, and I can't stop myself from blabbing when it comes to him because he's my second favorite superhero. Talk somehow drifted to the new Star Wars movies and most of us engaged - men and women. I include this background because it establishes that hey, some of us ladies at the table like comics and Star Wars. But then, one of the guys at the table made an insinuation that was something like, oh, ladies only watch Arrow cause Oliver Queen takes his shirt off frequently. I ignored it. But when Colin Donnell (Tommy Merlyn) came over to the table the guy flat out put it in a question, "Besides Stephen taking off his shirt - which is what they're all here for and I'm here for the comic book aspect - what do you find causes the show to have crossover appeal?" The part of his sentence that made me have to hold back a surge of Hulk rage was him gesturing to the ladies and not thinking any of us where there because we liked the comic or the drama - that we only watch because of the shapely pectorals on display. His tone also was not my favorite. I'm not going to pretend I don't enjoy Stephen Amell's bare upper torso. He works hard on it, it should be appreciated. The Arrow billboards around Los Angeles last fall featuring shirtless Oliver were enough to distract me from a traffic light. I can't say I had any knowledge of the comic book character before watching the series either, but it doesn't mean other ladies there didn't. I also am not trying to insult women who only tune in for the abs. I know at least one of them who started watching for just that reason. I'm just weary of the lumping. Clearly if one of us ladies only watches it for the skin, all of us must. 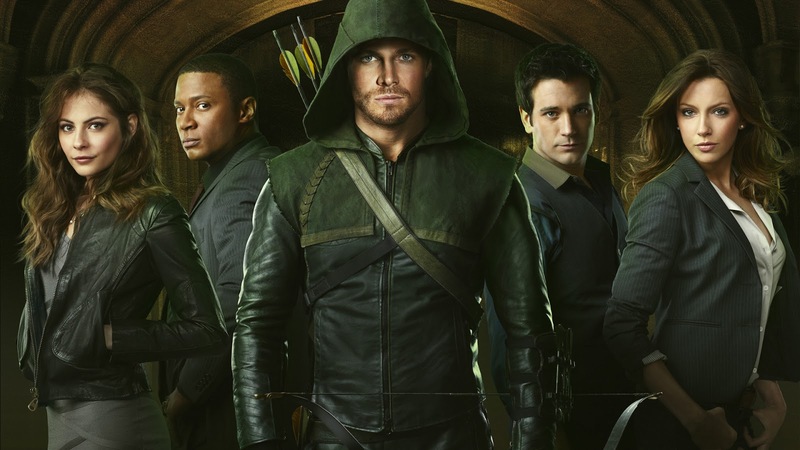 There's more to Arrow than eye candy. Lots more. As I mentioned, I don't have specific familiarity with Green Arrow. I know just enough about the DC universe to catch some of the Easter eggs the writers include in the episodes. But I don't need the background to enjoy the drama and stories. I appreciate how the creative team waits for stories that fit characters from the comics instead of just inserting them for no other reason than name dropping. Marc Guggenheim confirmed the reasoning at the press room, and I think the appearance of the Royal Flush Gang is a perfect example of how the comics history is woven in without being shoved in your face. The story of a faltering city and its savior is a classic superhero tale, but it's different because Oliver Queen doesn't shy from taking people down. For better or worse, he kills when he has to and when he feels there's no other alternative. He's not afraid of crossing the line, and he gives himself a lot of authority. That hook is interesting. Then, the characters. I've seen people take shots at how flat they are. While I admit I don't get everyone's motivations yet (and they're renewed for next season so I don't need to know everything right now), I enjoy how several of the characters shine. Laurel Lance can take care of herself. Sure, she calls the vigilante for help, but the girl can fight. Her instinct doesn't seem to be run and hide, it's stand up and kick where it hurts. That trait alone is refreshing and the best part is she's not like that because the writers want to add in token "strong female" traits. It makes sense for her character. Her dad's a cop, she often entangles herself legally with Starling City's immoral scum - it's only natural she would learn at least basic self defense. She's brave and determined and she has crazy resolve. But she's also human. She has vulnerable moments, and she makes mistakes. She's well-rounded (yes, I'm using that word) and she's just one of such characters in the series. I could go on at length about Felicity Smoak. She's my favorite character on Arrow. Who doesn't want to grow up to be her or at least be her best friend? Felicity is the queen of clever but not smarmy or annoyingly arrogant. She knows when to keep secrets. She isn't shy about commenting on Oliver's physique or being blunt with him. Again, she's not bullet proof. Getting used to the way bodies tend to drop when Green Arrow is around is definitely an adjustment period for her. I shouldn't have to point that out, but when it comes to lady characters, series often make the mistake of making them infallible or taking away all signs of femininity. They also don't do go that route - Felicity wears the best earrings and lipstick. John Diggle is another one to watch. I liked where they were going with him from the moment Diggle told Oliver he wouldn't be his sidekick but he would be his partner. He keeps Oliver grounded and tries to remind of his humanity. I could see him playing a part in steering Oliver towards a more virtuous, less vengeful path. Tommy Merlyn has evolved from a whiny, somewhat spineless dude to a man. His complications with Laurel and Oliver pushed him to an interesting place, but Tommy never acts like a typical jealous boyfriend. He channels it in a different way but note there was none of him screaming and going on the offensive with Laurel and Oliver in "Home Invasion" like there would have been in a weaker show. And of course, I can't forget Oliver Queen. You only have to glimpse from island Oliver to present day Oliver to see the difference. No one has gone through as many changes, and Oliver still has so many ahead because this lifestyle has to get to him. Even if he believes it's right and it's a form of justice, he's killing people. It has to eat at your soul. Plus, he has to wrestle with an insane number of secrets. He has Starling City on his shoulders and even though Diggle and Felicity work with him, they can't exactly relate. Oliver is more than just a rich guy with a talent for archery. The series has its flaws just like anything else, but overall there is plenty to watch and get into. I don't want to make assumptions like the guy in the press room did, but I bet he likes the show for more reasons than just the comic book history and maybe even for some of the same reasons I enjoy it so much. I hope he's more open minded in the future.